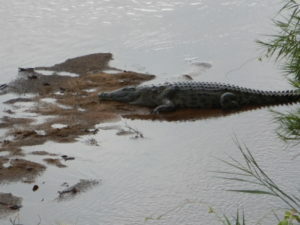 The Crocodile Specialists always meet where crocodiles are, which is why we found ourselves at Kruger National Park in South Africa. Naturally we used our free time to get away from the dark and windowless conference room to go outside and look around. 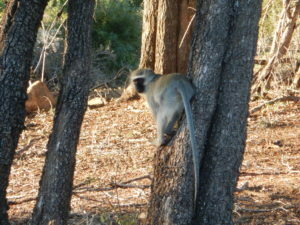 Kruger Park is 7,523 square miles, about the same size as the Okavango Delta. Accommodation in the park is set up in a series of lodges and camps, each with its own character and price range. 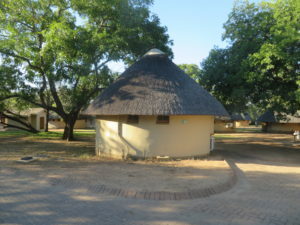 The Croc conference was hosted by Skukuza Rest Camp, which is the largest camp in Kruger and has add-on facilities like a restaurant, fuel station, and gift shop. 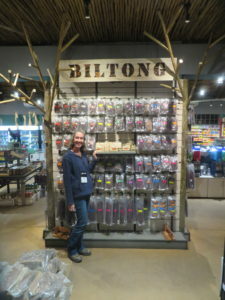 If you continue to read my blog, you will find that I am a biltong addict. The Skukuza gift shop offers a sumptuous array of beef and game biltong and I bought as much as I thought I could eat before having to cross the border back into Botswana (where Customs restricts meat imports). Our bungalow in Kruger. Inside this tiny hut was a double bed, a full bathroom, a fridge, a couple small tables, and a closet with lockable doors to keep the monkeys out. According to their website, Skukuza is “in the heart of Big Five territory”. In Africa, the “Big Five” are lion, elephant, Cape buffalo, leopard, and rhinoceros. These five species are apparently the most difficult and dangerous animals to hunt on foot, all the more reason to view them from a land cruiser armed only with a camera. Skukuza is a fenced camp. The fence is pretty good for keeping the big five out, but there were still plenty of warthogs and vervet monkeys foraging around our bungalow. Our bungalow door was adorned with a photograph of a toothy monkey and dire warnings about the consequences of leaving windows open or food on the patio. I didn’t feed the monkeys but I can understand why people do. They are so appealing. 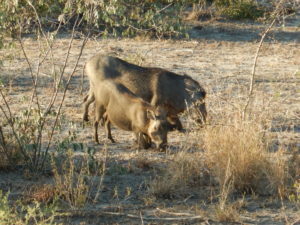 Being in the heart of “Big Five” territory, we were pretty optimistic about seeing all five. 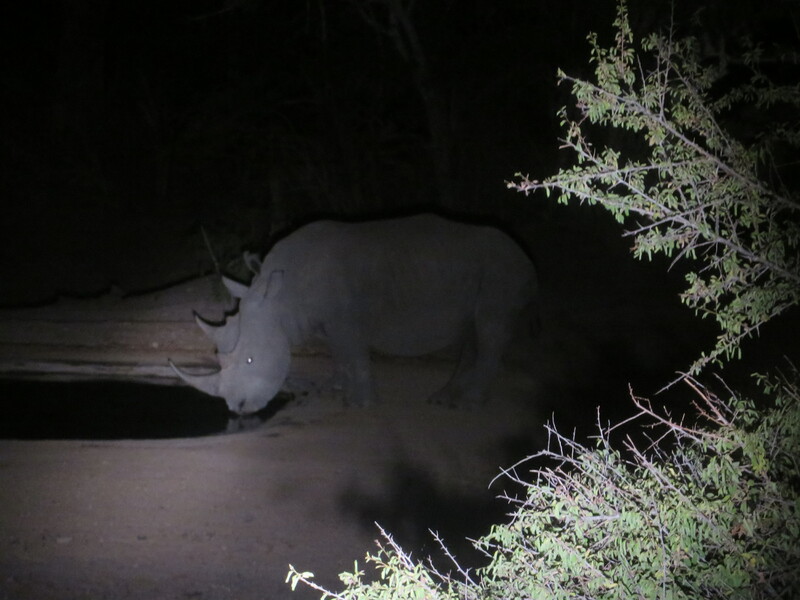 After six days, we managed to see the “Big Two” – rhino and elephants. But I am not complaining. 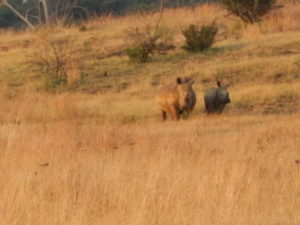 Kruger was the only place I saw rhino and their amazingness defies description. Rhinos are excruciatingly endangered and not for the usual reasons I spend my time thinking about (pollution, habitat destruction). 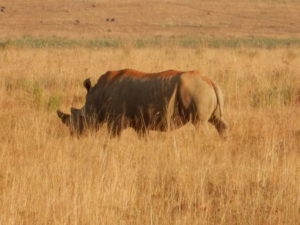 No – rhinos are killed for their horns, which are considered a pharmaceutical necessity and status symbol, particularly in some Asian communities. But the US is not immune, and there is enough American trafficking of rhino horn that several states have outlawed it specifically. Rhino horn is made mainly of keratin, like fingernails and hair. So, instead of paying $60,000 to $100,000 per kilogram for rhino horn, enthusiasts could derive the same medical benefits from biting their fingernails (toenails also work) or eating their hair. It’s not medically supported that rhino horn prevents hangovers, stops fevers, or assists recovery from anti-cancer therapies, but the placebo effect is powerful too and sometimes it’s enough. Personally, I find aspirin quite useful, but I’m a cheap-skate that way. I asked a friend in Maun how much money is made by poachers when they kill a rhino and sell its horn. While pondering this question, consider the life of a poacher. Poachers must walk or drive through the African bush, often at night, with heavy guns on their shoulders and possibly no shoes on their feet. I guess those guns are useful when they come across a stalking lion. Too bad if they step on a venomous puff adder instead. At all times, poachers must avoid detection by anti-poaching units who are allowed, even encouraged to shoot poachers, possibly before their poaching activities are confirmed. Poachers run the very real risk of landing in harsh prisons with poor living conditions. If they can’t pay their fines, they might be subjected to caning and other forms of corporal punishment. I read this in a March 2016 article published in the Mail and Guardian. For the danger, poachers make, according to my friend in Maun, $200-$500 per rhino horn – and presumably they need to split this money with their friends – poachers rarely work alone. From there, the horn passes through the black box of the black market and emerges as a commodity worth more than gold and cocaine. I do not know how reliable the $200-$500 value per rhino horn is. This is word of mouth from a person who is not a poacher, but well connected in a community that cares deeply about conservation of African wildlife and includes people who work in anti-poaching units. If you have more confirmed information about rhino horn prices received by poachers, send me a comment in the field below. The thing I don’t understand about rhino genocide is why the poachers make so little when the commodity is worth so much. Don’t get me wrong – I do not support killing rhinos at all. But I also don’t support colonial style natural resource extraction where the local people doing the (dangerous) labor get paid a pittance to irreversibly ravage their landscape while some well-dressed person in a foreign country reaps the real economic rewards. Let’s face it. $500 for a horn that will later sell for $120,000 – $300,000 (horns weigh 2-3 kg) is not equitable, no matter how you justify it. And no one is paying for the economic losses associated with one less grazer shaping the southern African ecosystem. A mother rhino with her calf. That cost will emerge vaguely over time as lost tourism dollars and changes in ecosystem function that we can’t predict, due to lack of knowledge. The only guarantee is there will be change. How much it matters will depend on Africa’s ability to plan for and manage a sustainable and self-sufficient future. During our Kruger conference, we learned about anti-poaching efforts in the park from Kruger head veterinarian, Markus Hofmeyr. Despite a major effort, the park struggles to contain poaching. They continue to lose hundreds of rhino and elephant in a year. As Hofmeyr says, the problems of poaching in the park can only be solved by addressing problems outside the park – by which I expect he means poverty, corruption, greed, desperation. A friend asked me if you can de-horn rhino. Yes – that’s been done. It’s like trimming your fingernails as much as you can – and like fingernails, the horn grows back. But, enough horn remains at the base that it’s still worth poaching so desperate poachers still kill de-horned rhinos. Also a rhino needs its horn to defend itself and its babies against predators, so dehorning is not a great solution. It’s taken me three days to write this post because I can’t figure out a solution that will save the rhino. Obviously I’m not alone, or it would have been done already. That said, I can suggest three things that could be helpful. A commitment to saving the rhino. The world needs to be serious with a “just say no” attitude to all things rhino (except conservation). A lot of stuff goes on behind closed doors and people turn a blind eye when they shouldn’t. A major change in attitude and awareness among those who buy rhino horn. These people are funding the trade and they need to find a new obsession. A refusal by poachers to let the black market steal their wealth, which comes in the form of a rhino horn. If all the wealth of selling rhino horn went back to the African communities that produce it, wouldn’t that help relieve the poverty and desperation that drives poaching in the first place? They have to cut out all the black market middlemen. There is a 4th idea brewing as well. An entrepreneur named Matthew Markus is developing a bio-identical substitute for real rhino horn that can be shaped using a 3D printer. The synthetic horn has four major advantages – no animals are killed, rhinos are conserved, the cost is lower, and the synthetic version is free of contaminants. Synthetic horn does not contain traces of industrial chemicals, pesticides, or radioactivity, which are found in natural rhino horn (and our hair and fingernails). The plan to print synthetic horn is not supported by many conservationists, who believe the wild market will only be encouraged by adding fake horn to the mix. I have no market expertise on this, but I think it’s worth trying alternative approaches because current conservation efforts are only partially successful. I do know that I love the faux fur trim on my winter coat and I love it especially because it did not come from an animal. So faux can be better.